I was one of the testers for this pattern and I struggled a little since the pattern called for skills I had never tried before (the sweetheart neckline, the heart shape in the back, the criss cross front, the slick way to do the shoulder straps to prevent bulk, and the way to prevent the elastic from directly touching the skin and keeping all seams enclosed.) Once I completed the bra, I wondered why I had never tried any of these techniques before! 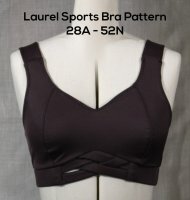 This is the first sports bra that I have made that fits correctly without a bunch of modifications ( and I have tried several patterns to get a pattern in my size a 46M.) I wore it all day the other day without issues of it riding up, the dreaded looking uniboob, or the straps digging in uncomfortably. If you want a great fitting bra from the first try, I suggest you give this pattern a whirl! On a side note, I loved the plush elastic for the shoulder straps that came in the bra kit and plan on buying more to use for the waistband on some UnderArmour type of bike shorts.